With the 2016 season rapidly approaching, MaxLax consulted with a handful of area coaches, numerous all-league lists and pored over more than a few rosters, recruiting lists and club teams to identify the players to watch heading into the season. Many of these players have earned reputations as San Diego’s best in their time in the county. Of course, as with any list, not every potential star player could be named. This particular list aims only to identify key players entering the 2016 season. What happens next will be determined on the field. Today, we look at defenders, a junior and three seniors — including Beau Botkiss of Torrey Pines (pictured above): Crew Taylor, senior, La Costa Canyon Taylor is the anchor of a very experienced LCC defense that returns all of its starters. Taylor, an all-Avocado West second-team selection last spring, is a stalwart and threatening defender who deftly runs coach Foss’ system. Like teammate McLean, Taylor would like nothing more than to cap his La Costa Canyon career with deep run in the Open Division tournament. Taylor is still deciding his college plans, with interest from a handful of top schools. Beau Botkiss, senior, Torrey Pines Botkiss is a tenacious and surgical defenseman with a penchant for quick offense in transition. He has many honors under his belt, including a spot on the Under Armor West Team, U.S. Lacrosse All-American and the No. 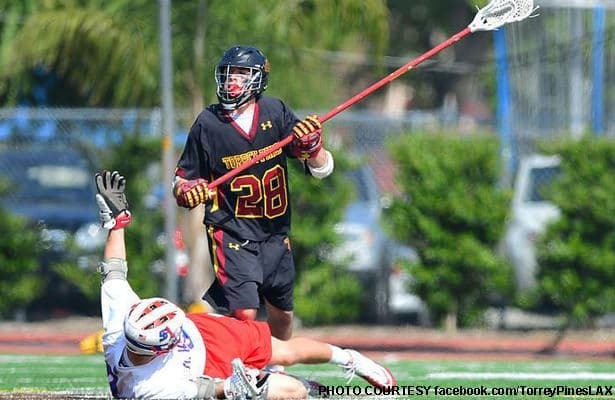 14 spot in Inside Lacrosse’s recruit rankings for the Class of 2016. Expect to see Botkiss hungrier than ever to win an Open Championship before he heads off to Harvard next season. Bailey McLaughlin, senior, Poway McLaughlin, committed to play at NCAA D-II Colorado Mesa next fall, returns to the Titans looking to anchor an experienced defense that helped Poway win the Open title last May. He’s a fundamental player around whom Coach Zack Burke can build his defense. Mikhael Eyerman, junior, Coronado Only a sophomore last year, Eyerman is a surgeon with his takeaway checks. Coronado might still be young in the defense this year, but the Islanders are not lacking in experience. Expect to see Eyerman take a leading role in defending the cage this year. He is committed to the University of Delaware. Who else is a defender to watch in the San Diego area? Let us know in the comments below.